What are the origins of the Tarot Nouveau (French Tarot)? Tarot Nouveau is believed to be the general name of the tarot deck or style of tarot deck made available for free download from the link stated below. It is also very similar to the tarot deck illustrated in the hand of cards shown on the right, which is from the Wikipedia entry for French tarot where there is a description of a tarot game said to be popular in France and the French-speaking areas of Canada. The tarot deck whose origin is considered here seems to be known as both the "Tarot Nouveau" and the "French Tarot" as well as by some other names, especially in other languages. It is obvious from the style, more about which follows below, that this is a very old tarot deck and that it has probably been used for playing card games, 'tarot games' instead of, or possibly as well as, for use of the tarot as a means of gaining insight into personal situations, issues or challenges. The cards of the tarot deck shown in the hand of cards above-right is very similar to the cards in the deck illustrated at a much reduced size (because all 78 cards are included) on the right. The description supplied to Wikipedia with this card deck states(ed) only that it is a "78 card French tarot deck in 300 DPI resolution equal to its original print raster. Probably Piatnik brand, but other modern French tarots are very similar". We set out to find out more about the origins of this tarot deck. So far it has not been possible to find detailed historical information about this tarot deck, that is - specific, accurate and reliable information about who first designed and published the tarot deck uploaded to Wikipedia by Paralingua on 10 Sept.'09, or where and when it was printed. It is more difficult to establish the artist or other original copyright owner of a "style" of tarot cards than that for a specific named deck. It seems reasonable to accept from the nature of the Tarot Nouveau together with general historical comments about it found online, that the general style originated in France. 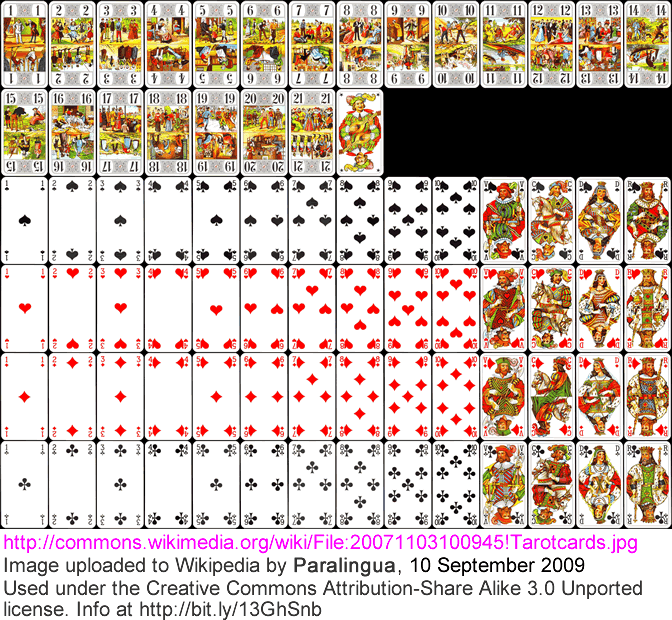 However, according to The International Playing-Card Society's webpage http://i-p-c-s.org/pattern/ps-18.html, the style of decks of this general type, i.e. similar to the tarot nouveau cards shown on this page (above), for which it recommends the name "Bourgeois Tarot", originated in the late 19th century with the card maker C.L. Wüst based in Frankfurt, Germany. Unfortunately for this research the cards illustrated on their page about the "Bourgeois Tarot" are not all from the same deck. Given that the designs of the actual cards shown vary, it was not possible to use information from there to find out more about the origin of the specific version of the Tarot Nouveau of most interest here. Some sources e.g. https://sites.google.com/site/tacticclub/Home/introduction/l-histoire-du-tarot date the Tarot Nouveau (style) from around the year 1900. French cardmakers in the early 1900s included Baptiste Paul Grimaud (1817-1899) who bought the Paris cardmaker "Lequart & Mignot" in 1891 and founded the famous Grimaud house, publishers of the Tarot de Marseille tarot decks. The "Piatnik brand" comment probably refers to the Austrian-Hungarian card painter and manufacturer Ferdinand Piatnik (1819 - 1885) who bought a card company in 1843 and went on to turn it into one of the of the most successful game manufacturing companies at that time. In 1882 his company was renamed Ferd. Piatnik & Söhne (A.G.). It is still in business today though none of the tarot decks we could find on their website in 2013 looked anything like this 1900s version made available for general use via Wikipedia. Due to high resolution versions of images of these Tarot Nouveau tarot cards being available via Wikipedia, it is possible to find and study some minor details that distinguish the (very similar) cards from each other and provide some information about the geographical origin and the design or manufacture of the cards - see below. As shown above, closer inspection of the cards shown in the "hand of cards" reveals the word FRANCE printed on the long-side of the cards. That word is not present on the cards forming the complete deck of Tarot Nouveau tarot cards made available by Paralingua (Sept.'2009). However, that full deck of Tarot Nouveau tarot cards reveals a symbol that looks like an elabourate upper-case letter "P" located at the top and bottom of all the cards of the major arcana. The symbol is accentuated by appearing partly in red in the centre of a design printed in black ink only. 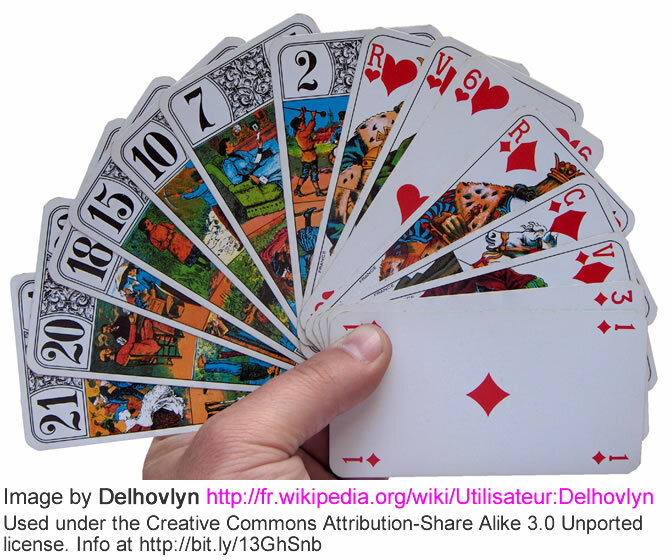 It is not present on the cards shown in the "hand" of Tarot Nouveau tarot cards, above-right. The "P" symbol suggests that the speculation that the deck of cards are a "Piatnik brand" may be accurate, in which case they might not have been designed, printed or published in France, as in the case of the other similar cards, but in Austria or Hungary. The tarot card images shown above (top-right of this page) are believed to be of the Tarot Nouveau. It seems preferable to refer to simply the 'Tarot Nouveau' rather than to the 'Tarot Nouveau tarot deck' because it has been suggested that the expression Tarot Nouveau really refers to an artistic style of tarot cards dating from the early 1900s, rather than to any specific set of tarot cards. According to examples seen on various webpages, several similar but not identical tarot decks seem to be loosely referred to as Tarot Nouveau. No information has been found online that conflicts with where (when we last checked and the image and description was present, which was in 2013) it stated that images of the tarot cards shown on that page are - as stated with the high resolution version of the images of the cards, licensed for general FREE use under the Creative Commons Attribution-Share Alike 3.0 Unported license. It seems likely that the file depicting the full deck of tarot cards in this 1900s style was made available for general use based on the age of the cards placing them in the public domain due to copyright expired worldwide, although that is not stated explicitly. Note: The above is based on limited online research. Despite best efforts and good intentions, it might not be 100% accurate and does not include complete information about the history incl. the previous ownership of the copyright of the tarot cards featured here, merely that they are used having been made available via Wikimedia under the Creative Commons Attribution-Share Alike 3.0 Unported license' uploaded 2009.